Fancy a bike ride ladies? The new Tauranga Waterfront will officially open on Sunday the 23rd September and Frocks on Bikes will be there! Tauranga City Council and Mainstreet Tauranga are celebrating the completion of the first stage of the city’s new waterfront. We like this because the waterfront is now bicycle and pedestrian friendly! To celebrate Frocks on Bikes will lead a bike tour connecting several of our favourite waterfront parks starting and finishing at the waterfront in downtown Tauranga. Route: A flat 12km ride to Fergusson Park and back via Crescent Drive-Sulphur Point-Chapel Street-Kulim Park. The ride will be followed by refreshments at Bravo Cafe – show your helmet for discounted coffee! The official ceremony begins at 2:30pm followed by an afternoon and evening of free activities and entertainment culminating with a fireworks show at 8pm. Free event parking available at Spring Street Parking Building. Don’t forget- $2 coffee at Bravo Cafe for citizen’s using the bus or bike during car free week -September 17-23. Show your bus ticket or bike helmet when placing your coffee order. This offer is good on our Sunday ride day as well! World Car Free Day is 22 Sept with over 1000 cities world wide taking part, including Tauranga. Question: What does a Frocker do when she discovers her bicycle is suffering from technical difficulties? Answer:Use her super cycle know-how powers to fix it, of course! Do you panic when your bike chain falls off? Wish you could adjust your seat but don’t know how? Have you ever changed a bicycle tyre before? Do you have the correct tools for this super power manoeuvre? Don’t be a lady in distress! Join us for a friendly “no stupid questions” bicycle maintenance clinic at Red Bike Wednesday 27 June 6-8pm. Red Bike is a new bike shop on the Mount main street specialising in Specialized bicycles and related products. Owners Grant and Carolyn Lyon have invited Frocks on Bikes to attend an evening at their shop to learn bicycle maintenance and repair basics. Super! To make it even more welcoming there will be wine, cheese, and home baked goodies to help feed your new “super powers” plus spot prizes and a special FOB discount on the night! It’s all about gaining confidence and having more reason to ride then not to ride ladies! Become a Street Savvy Woman and show other road users how smart and confident you are while cycling! Get the basic skills you need for safe and confident street riding – call it “beginners” if you like, but it’s skill we all need! If roundabouts make you feel a bit nervous, or approaching potholes / parked cars / 4-way inersections make you long for the footpath – Street Skills is for you! Come learn about road rules and bike safety from two very street savvy cyclists. Iris Thomas from Kids Can Ride bicycle saftey programme and Vanessa Quin former World Champion Downhill Mountain Biker are teaming up to give women an opportunity to learn first hand about cyclist’s road rights and responsibilites. Meet outside the Courthouse on Cameron Road at 9am. Bring your own bicycle, a helmet, and hi-vis gear if you have it. Hi-vis vests will be provided for those without. “What! Hi-vis?” you say. It’s required ladies. It will get us noticed and identify us as a group AND we want to do exactly what Iris tells us to do! We will review road rules and bike safety first, then put into practice what we learn with a group ride. Q&A session afterwards with prizes. Please let us know if you wish to attend. If there is something you want to try on Cameron Road let us know that too! Lunch and coffee at a local cafe following the clinic. Why? Because you must reward yourself for being so GOOD! Saturday April 21 – Regency Fashions A La Mode at Tauranga Art Gallery- registration now closed. 1pm – Arrive at Tga Art Gallery to see deliciously feminine fashion. 45 hand coloured plates from 1809-1828. 2pm – Angela Lassig, Fashion Historian from Auckland, will give an illustrated talk on Rudolph Ackermann and his popular periodical, the Repository of Arts, Literature, Comerce, Manufactures, Fashion and Politics (from which the prints in A La Mode originate). This will be followed by a high tea provided by Friends of the Gallery. BYO fine china cup if you wish! There is a $10 event fee which must be paid in advance. Frocks on Bikes has 10 seats reserved for the floor talk and high tea. Send us your name by email so we can put you on the list! Deadline Monday April 16th. This event is SOLD OUT ladies, which makes these seats hot, hot, hot! You must pay for your seat at the gallery before the floor talk. OK to pay on the day by noon. Tell the gallery you are with Frocks on Bikes. They will have a list of Frocker’s names at the front desk. Frocks on Bikes are celebrating Earth Hour! Marcel Currin, Leah Carroll and Ukes-A-Plenty. Join our celebrations under the stars as Tauranga leads the world into this global event. with a calender of events on sustainable living – including this fabulous event! Why? Because riding a bicycle in your favourite frock is fun. It is also a sustainable mode of transportation which we love. We will ride the 9.1K track around Waikareao Estuary Reserve. The track includes dirt path, boardwalk, and paved sections. Bring a bike suitable for this terrain and don’t forget your helmet! Meet at Maxwells Road at the entrance to the Daisy Hardwick Walkway in Otumoetai. This popular walkway is open to bicycles. Please remember to be friendly & courteous to other users. Bring your own picnic for an after-ride social in the park. We’ll be wearing a touch of green to show our earth friendly sustainability side. or at Tauranga Environment Centre. Check it out! Bike Wise 2012 is HERE!!! Bike Wise month funded by NZTA is a national celebration of the bicycle. Hop on your bike and take part in the array of events and activities available throughout February. In Tauranga/WBOP we are bringing to you 36 events across the month. These include, bike basics workshops, mountain biking, BMX, family events, road cycling, frocks on bikes, tykes on trikes and everything in between, there is something for everyone. Kicking off Bike Wise next week is More FM Go By Bike Day! Wednesday 1st February, 6:45am – 8:30am, Red Square, Tauranga CBD. All commuter cyclists join us for a FREE breakfast on National Go By Bike Day. A great day to start commuting by bike to the city, cross the finish line in Red Square and receive your breakfast (check out http://cityzoom.tauranga.govt.nzfor cycle routes from your home). Pick up a Bike Wise 2012 calendar from your local library or check it out on www.sportbop.co.nz and mark the dates in your diary now! February is Bike Wise Month! To kick it off, Frocks on Bikes Tauranga are attending the go by bike breakfast on the 1st of February. Holly and Rosie will be leaving Welcome Bay at 7am and cruising to Red Square to meet up with other Frockers. For more information, contact us. Bring your sweetheart along on our 2nd annual Valentine’s Ride and Frocknic! 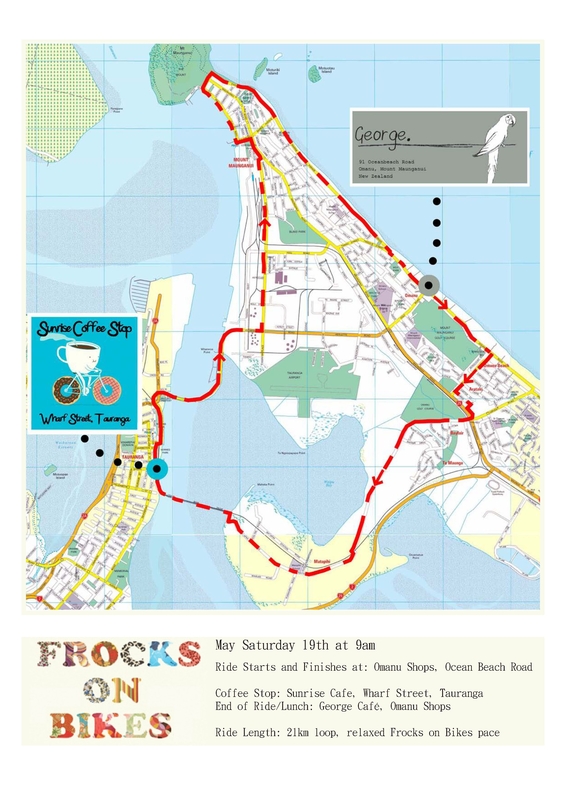 Our route: Prepare to set off on a romantic bike ride departing from Robbins Park, traveling down Devonport Road to Memorial Park and circling the frockingly fabulous fountain, returning on Devonport Road back to the rose gardens for a frockalocious frocknic in the park! What should you bring? a road worthy bicycle, a helmet, your sweetheart, some nibbles & beverages, and a smile! Red, Pink and White theme. Wear a frock ladies and your finest threads gentlemen. Let’s show Tauranga that its citizens can use sustainable transportation in style! Our flock is one year old! It’s time to celebrate! Yep, that’s right. We started our local flock one year ago and we want to celebrate by going for a ride! This special event will take place on Wednesday January 18th starting at 6pm at the Mount Surf Club. Join other enthusiastic frockers for a beach side spin down Marine Parade ending at Astrolabe Restaurant for celebratory refreshments and cake. Rain Plan: If, heaven forbid, the weather turns sour when it is time to ride, we will skip the glamor roll and head directly to Astrolabe for a fabulous gathering of the flock indoors. We hope this won’t be necessary, because frockers look their best with wind blown locks just after a ride! It has been a fabulous year getting to know you all and sharing our love of cycling with you. We look forward to more two-wheeled fun in 2012. Hugs and kisses and lots of ringing bells! We will see you all in 2012 for some more fabulous frocking and fun! Interested in joining us for a little spin at the Mount? Frocks on Bikes was invited to add an event to Sport Bay of Plenty’s Live to Play calendar this year. Surely you have seen these calendars publicised in local newspapers, non? We have organised an event connecting parks and reserves at the Mount for your riding pleasure! What makes an event like this one good fun? Your participation!!! We love to see stylish ladies rolling down the avenues, wind in their hair, happy to be spending a Saturday morning doing what they love – riding a bicycle! Ohhhh… how we love riding our bikes, don’t we ladies!! Why: Because you know what’s good for you! Join us for a social hour at a local cafe following the ride. You ask why? Because frockers take re-hydration seriously, of course! And we’d like to get to know you better too! If you want to join us PLEASE reply and let us know. We would love to have some numbers before the event to help us plan our fun! Are you excited about springtime arriving? We certainly are! Your fearless two-wheeled leaders- Holly, Rosie and Charlotte, are gearing up for some frockalicious fun times ahead! Saturday, September 17th – Rosie and a handful of other bike babes dressed in frocks will be pedalling over to Mills Reef Winery to attend the Tarnished Frocks and Divas matinee show at 2:30pm. Tickets for this fabulous performance arts and fashion extravaganza have sold out but those lucky enough to have tickets can join other frockers and arrive in style a la bicyclette! Contact Rosie by leaving a message here or email us- frocksonbikes.tauranga@gmail.com. Saturday, October 29th – Sports Bay of Plenty ‘Live to Play’ calendar of events includes yours truly with a Frocks on Bikes “connect the parks” tour at the Mount. Join us for a social hour at a local cafe following the ride, because frockers take re-hydration seriously! You will receive a reminder about this event 2 weeks before the day with all the important details. There’s so much fun to be had on two wheels! We look forward to catching up with you! This Saturday we have planned an art gallery tour just for you fabulous FROCKERS! Because women cyclists appreciate art too! Where: Meet at Creative Tauranga on the corner of Wharf and Willow streets. Galleries: Creative Tauranga; Harrisons Gallery; Gallery 59; and the Tauranga Art Gallery. 1pm lunch: at a local cafe so we can further assess local art over food and drinks. Pssst! Harrisons Gallery is celebrating 50 years in the Bay. There will be 50 works by local artists on display as part of the celebration. Cool! Please kindly RSVP so we can tell the galleries how many frockers they can expect to meet. They may treat us to something special if they know how many of us will be gracing their galleries. If it is RAINING on the day and we have to cancel the tour, we will notify you by email at 9:00am that morning. Think sunshine ladies! Upcoming rides for November and December! November : Connect the Parks Ride: Easy ride on the flat leaving from Mt Drury at Mount Maunganu on the 19th. departing at 10am. December: Art Ride: Ride from Tauranga central down to 11th Avenue, stopping to take in some ART along the way. Meet at 10 am on the 3rd December at Creative Tauranga on 112 willow Street. Come learn about road rules and bike safety from two very street savvy cyclists. Iris Thomas founder of Kids Can Ride bicycle saftey programme and Vanessa Quin former World Champion Downhill Mountain Biker are teaming up to give women an opportunity to learn first hand about cyclist’s road rights and responsibilites.